With the exception of the awful heat and a few portions of the course, I had a great time. I was able to finish, but unfortunately Cathy got swept up (more on that in the next post, but I am proud of her pushing through 22 miles while being sick). My final finishing time was right around 7 hours, but I am happy with that given the circumstances. We arrived in Orlando on Friday evening. It was too late to make it to the expo, so after checking into the Allstar Music Resort, we headed to Downtown Disney for dinner and shopping. 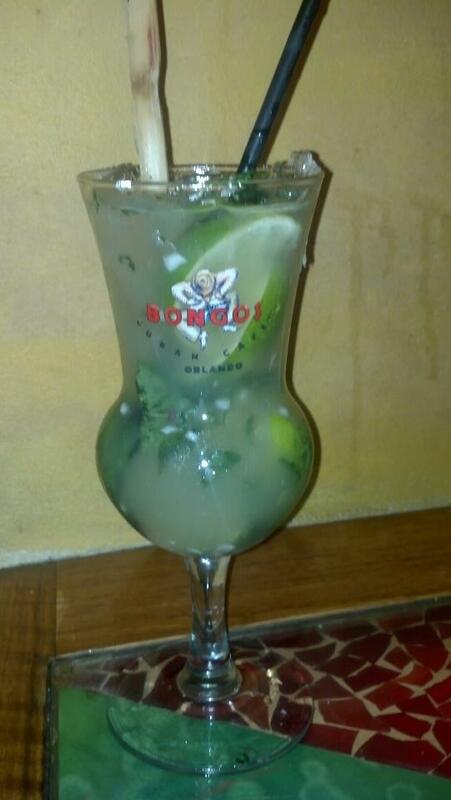 After checking out the available options for dinner, we settled on Bongos Cuban Cafe. Having grown up in South Florida, we both enjoy good Cuban food. Cathy and I enjoyed some great pre-race celebratory mojitos. We both enjoyed our meals, with the exception of the plantains. Instead of the usual fried sweet plantains, they served fried green plantains. They were bland and dry and needed some sort of sauce to make them palatable. Based on that and the price, I don't know that we will ever eat at a Bongos again. We walked through the rest of Downtown Disney/Pleasure Island and did some shopping before calling it a night. As we walked through the area, we had a chance to reminisce about our many fun times at Pleasure Island. When we lived in Florida, we had Florida resident off season passes along with an annual pass to Pleasure Island. After a morning in the parks, we would crash in the afternoon so we could party all night at Pleasure Island and stumble back to the bus to get back to the hotel. Sadly they closed all the clubs in 2008 in favor of more dining and shopping. Our favorite club was Mannequins which played dance and techno music and featured a spinning floor. While they removed all the signage, the old buildings were still there and as we walked by each one, we remembered all the great times we had there. Saturday morning we decided to sleep in. We had debated a short run to loosen up, but sleep won out. It was probably the best idea since we knew sleep would be tough Saturday night given nerves and a scheduled 2 AM wake-up call. After having breakfast, we hopped on the bus to the expo at Disney's Wide World of Sports. Of the many big size runs I have done, including a couple of Rock n Roll races as well as several other triathlons and half marathons, I have to say this was one of the best run expos I have ever seen (with the exception of the narrow aisles). My only complaint would be that by Saturday morning, the marathon memorabilia was pretty sparse. Luckily, we found what we came for, which was mostly a WdW Marathon car magnet. I also found one other item to take home. While in Downtown Disney, I discovered something called Vinylmations, which are 3 inch plastic collectible figures. Being a Star Wars fan, I picked up one of their new series 2 Star Wars characters while there. 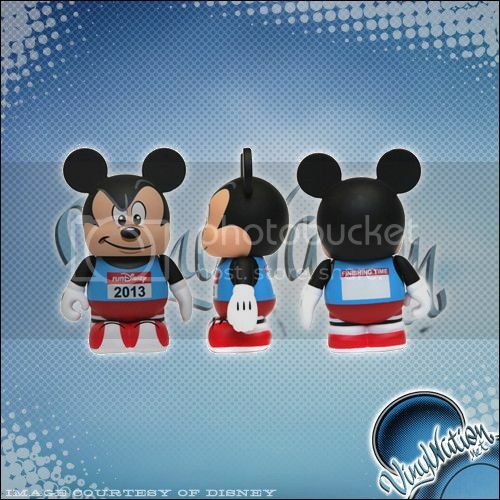 At the expo, I discovered a 2013 Run Disney Vinylmation. 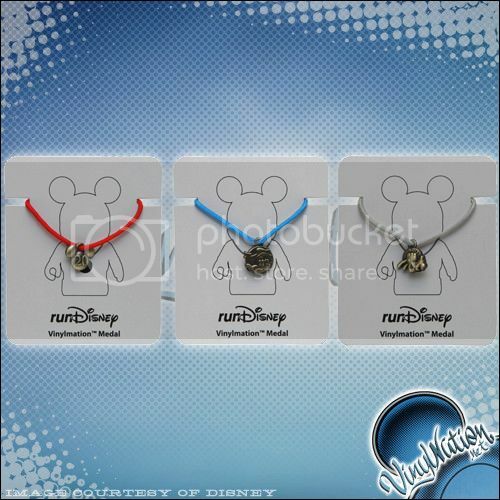 In addition to the figure, you could purchase a medal with the number 20 on it for the 20th anniversary. The other thing I found out is that on the back, there is a space to write in your finishing time. Mickey now sits on my desk at work as a reminder of what I was able to accomplish. At the expo, we also picked up several other goodies. One of my favorite things I picked up was a bondi band sweat band. Cathy has used them for several years, but I always thought they were a girly thing. 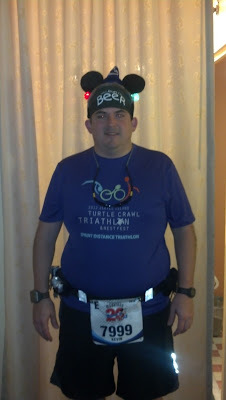 Because I had picked up some mickey ears for the run which would not work well with my headsweats visor, I decided to give it a try. I found the perfect message for mine, which elicited many comments as we ran through the parks with lots of spectators. I was very much impressed with its ability to keep the sweat out of my face. 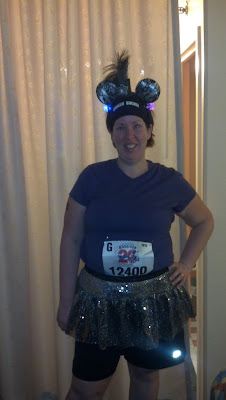 After what seemed like an eternity, our corral made it to the start at about 6:10. When the wheelchair racers went off at 5:30, there was a big fireworks show. For the next 40 minutes, with every move forward the music got louder, the energy got higher, and we were ready to roll. Once our group arrived at the start line, we had about 5 minutes to start.